Boltless Shelving is a fully adjustable shelving system. The shelving system ensures a carrying capacity of 100kg per shelf level with a full range of sizes to accommodate almost any product to be stored. Installation can be done in minutes due to the boltless nature of the unit. Heavier loads of up to 300kgs per level can be accommodated by using additional shelf support sections. 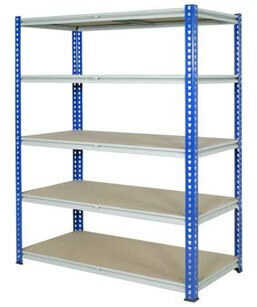 The boltless shelving system offers rigidity and is strong enough to accommodate a mezzanine floor. Versatility of the ‘clip-in’ shelves allows for quick and easy adjustments to suit your shelving requirements.